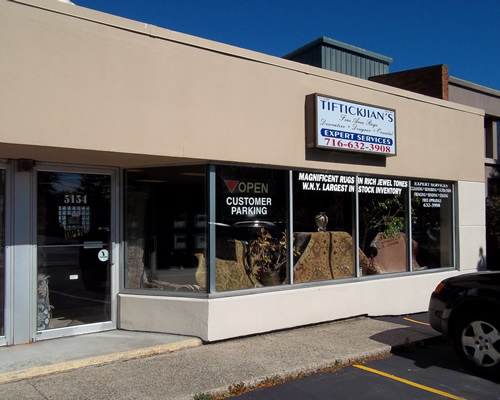 Tiftickjian Rugs has been a major provider of quality, uniquely colored area rugs to the Buffalo area since we opened our doors in 1899. Every rug we carry, whether it is hand-woven or machine woven, has been personally selected for its impeccable appearance and exquisite patterns. See us now to browse through our large selection of newly arrived 8x10 and 9x12 genuine all wool, hand-woven, quality area rugs priced from $1000 to $1250. The price includes many services not available from other dealers. A properly cared for, quality crafted area rug can enhance the beauty of your home for years to come. 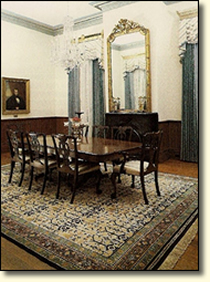 Here at Tiftickjian Rugs we would like to help you select the perfect area rug for your home. Each time a customer walks through our doors we share with them over a hundred years of expertise in the Buffalo area rug business. Take advantage of our knowledge. We will help you select the proper rug padding for your floor surface to minimize wear. Our goal is to help you make an educated purchasing decision. Our relationship with our customers does not stop with the sale either. We offer many after sales services such as rug cleaning using either a luster shampoo or dry cleaning method, expert stain removal, rug repair, rug refringing, and free in store appraisals. A properly cared for rug will maintain its beauty and value for years. A careful restoration of your rug to remove any stains and repair worn areas can enhance the value of your rug as well as bring out its natural beauty. Conveniently located in the heart of Western New York at 5154 Main St, Williamsville just a quarter mile north from the junction of I-90 and I-290 between Park Club Ln and North Forest Rd.